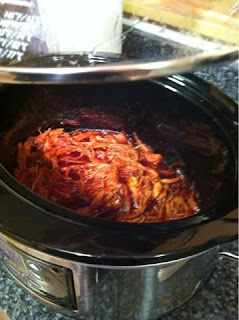 Daily Adventures of the SAHM: Best meal ever!? I'll make this short and sweet. I made an amazing[ly simple] dinner last night that took about as much effort as sitting down on the couch. I tossed a large frozen chicken breast into the slow cooker with ketchup, brown sugar, vinegar, siracha, garlic powder and some cumin. That's right, homemade BBQ sauce. 8 hours later, I shredded up the chicken and made a batch of kale chips. Kale chips: rinse head of kale, trim the ribs out and cut into 1 1/2 inch pieces. Dry well! I don't do so good with this last night and it makes a difference. Spritz with olive oil, throw on a dash of sea salt, spread out over a lined cookie sheet and bake at 375 for 10-15 minutes, until the edges turn brown and crispy. Um, yum. Healthy and ridiculously easy. So between the shredded BBQ chicken sandwiches and the kale chips, my husband declared it the bet dinner I'd ever made... And it was under 500 calories! SCORE! This sounds amazing! I'm making these next week. 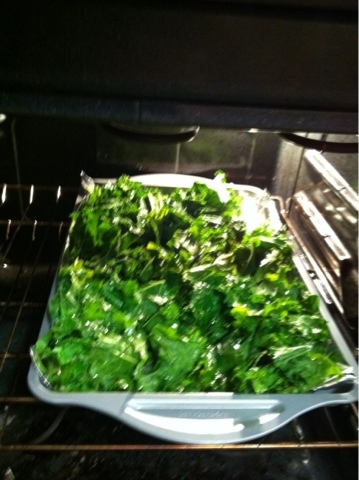 KALE CHIPS KALE CHIPS! They're incredible, right?! They key is nailing that perfect bake time between "oh my god, they're brown and taste like horrible" and "oh my OTHER god, they're all like... partially soggy." I'm at the point now where I keep kale already torn up and ready to go in the fridge. It's an addiction. It's AMAZING.